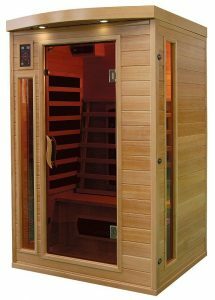 An Infrared Sauna is unlike a traditional sauna. It uses radiant heat to warm you from the inside instead of heating the air around you. Infrared Saunas help you release more toxins than a traditional sauna at a lower temperature allowing you to stay in longer. It heats your body while increasing your core body temperature. An Infrared session will calmly energize you, help rid the body of toxins, cleanse the skin, relax and rejuvenate you. One 30 minute session burns upwards of 500 Calories!. Studies Show that sweat from a traditional sauna contains about 3-5% toxins where sweat from your Infrared Sauna contains about 17-20% toxins. Blue: Lubricates joints. Helps address infections, stress, and nervous tension. Indigo: Activates and eliminates impurities from the blood stream. Violet: Relaxes the nerves & lymphatic system. Addresses inflammation & urinary issues. Non- member Infrared sessions include full use of the fitness facility, free parking, showers, lockers, and Alkaline water (offered in room). If you would like to become a member of Phoenix Fitness, and you purchase a 10 pack of Infrared sessions your initiation fee will be waived ($50 value) for club membership. Once a member you will then receive member Infrared Sauna rates as long as your membership is active.